Your birthday is a new year of sorts for me. I notice that I’ve made it through another year, the last two being particularly traumatic and challenging. But here I am. Something happened to me two Sundays ago that I can’t shake. I have been moving through my life suddenly and inexplicably feeling human again. Like an actual, real live human. I’m sure it’s been gradual, all the work I have been doing, these steep lessons I have been learning, my life continually demanding I go deeper and deeper into myself, but it seems sudden. I went to therapy that Monday and cried and cried because it was if I had left the forest, as if I could look back at the treachery I had emerged from and I my tears were a marveling. I cried purely for myself, which felt new. It wasn’t my circumstances or your absence or my heartbreak. I felt so much empathy for that woman who navigated that nightmare, those nightmares. I’ve made it to a point where I was able to stop for a minute and see from a short distance how excruciating and horrible it’s all been. How I became a shell and slowly but surely refilled that shell with an even better version of myself. I feel now, with tentativeness and mistrust, that I have made it through the worst. And I have done so with grace and presence and vulnerability and truth. I thought I was living with an open heart before. I thought I was compassionate and empathetic and loving and accepting but I had no idea how much deeper all of those rivers were flowing. I have access to them now in ways I never could have imagined. I am living into my truth, into my humanness in impossible ways, having endured the impossible, again and again and again and in short order. And I venture to say that it’s all because of you. You didn’t cause the infertility or the surgeries or the break up and yet your life and death seems to have been a catalyst for changes I never wanted, never would have chosen in a million years, but that, it turns out, I needed more than anything. Can you see what’s coming next? It’s gratitude. For you. For the life I have been given to live now. And for the first time in two years, I can actually feel it. It’s not all convoluted with wishing it different, with willing you back, it is not twinged with grief and horror and disbelief. It’s pure, unadulterated gratitude for you, that came here, that you moved into the world from my body and that you died in these very arms. I want you back. I have regrets and deep yearning but they seem to have separated themselves, untangled themselves from each other, become both recognizable and manageable. I guess it’s a new level of acceptance. A new level of understanding that you are gone and your dad is gone and any future children that would have come from my body are gone. I see that now, in moments, just as it is and by some miracle, it is okay. It is divined and destined and I will live into those realities, too. I will integrate them into this new version of myself. This woman I like and love a whole lot better than the one who was not yet Harvey’s mom. So let me tell you about it. Let me say to you what I know from this moment, from the end of two weeks, which included your birthday and anniversary, that I have returned to being human again. Here is what you have brought me so far. And so much more. I am courageous. I am unashamed. I have cried in the grocery store and the children’s indoor play area and at drop-off at Vesta’s school, with every parent, teacher and child in 8 grade levels there to witness. I have refrained from acting towards your dad and his girlfriend in the angry, spiteful and vengeful ways I have imagined I would like to. I have kept hateful words to myself. I have told anyone with access to a computer honestly and uncensored what my experience has been. I have written and spoken my inhumanness. The thoughts and feelings and beliefs that are hateful and angry. I have exposed myself as vulnerable and raw and broken. I have done these things despite nearly all of being telling me to do the opposite. Don’t cry in front of those people, lash out at those who have hurt you, hide yourself because your pain is too much for anyone to bear, just give up, it’s not worth it anymore, what’s the point? Out of utter and complete heartbreak, I went to your dad’s several weeks ago. I just needed a break. I just wanted to feel normal again for a minute. I just wanted to sit next to him, the person I was with nearly every day for 13 years. To talk to him and listen to him and laugh together again. I just wanted to pretend for awhile that everything is as it was and take an evening long hiatus from my longing and sorrow. I didn’t want to talk about anything hard or process anything or even acknowledge the chasm that is between us. So I asked if I could come, after several false starts and he agreed and I didn’t back out this time. We sat together for hours and talked and drank. And we did talk about the hard stuff. And he brought it up. We talked about you and how we are grieving now, how we are getting along without you and with the aftermath of navigating a life with a dead child. We talked about our relationship and what happened and he acknowledged and apologized in ways I didn’t think he ever would. But the point of this story is that he told me several times how courageous I was for coming there and each time I thought, and probably said, “this isn’t courage. This is desperation.” I’ve thought a lot about him telling me that in the weeks that have followed. 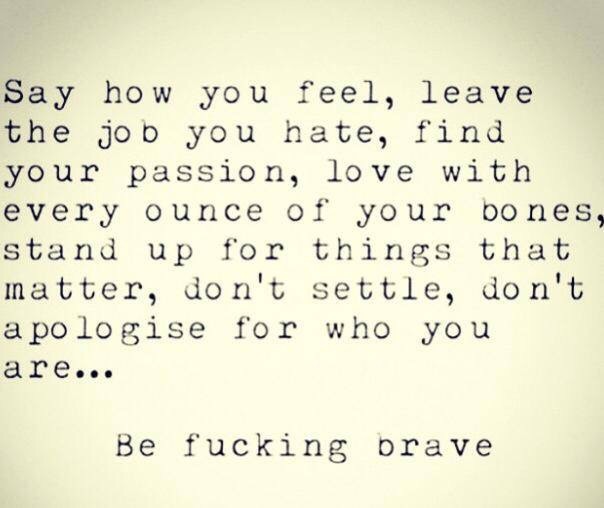 I’ve thought a lot about the million times I’ve heard from loved ones about how strong and brave I am and I have scoffed every time. What I’ve realized is that courage doesn’t feel like courage. Bravery doesn’t feel like bravery. Strength feels like absolute weakness and on the brink of giving up. Courage, bravery and strength are external, they are what other people can see that the person exhibiting them do not feel. Courage feels like desperation. Bravery feels like terror. Strength, in the moment, feels like surrender. When I stood in the shower begging God to give you back to me, negotiating and promising Him that I would be and do things in exchange, offering my own life in exchange for yours, the very last thing I felt was strong and courageous. But from my new vantage point, just outside that nightmare forest, I see myself as those things. I see that I was strong and brave enough to stand naked before God and pour my heart out to Him. That that was all I had in me. That that was how I got through those first days and weeks and months without you. I was pushed into a corner, I was broken into a million pieces on the ground and I kept going anyway. I did it anyway. I didn’t stop myself from believing in their moments that He might change his mind, that I might be able to do or say something that would land you alive and well in my arms at any moment. I let the crazy making of grief engulf me and I kept going. I am not fearless now, but I am invincible. My spirit, my will to survive, my very being, are invincible. I am brave and strong and courageous and I know now that in the moment, when I am being those things, I will feel nothing of them but I’ll just keep on going. I am resilient beyond all measure. The tragedies of this life, the ones that plague each and every one of us are about endurance. And if we can dive deep down into them, the tragedies, the terror we feel facing ourselves, the moments when we are sure we will die from the intensity of our experience, we learn that deep down there or at least when we get our heads above water for an instant or more, there is also grace, there is also forgiveness, there is also and always love. The trick is not to collapse. The trick is to keep going. To invite it all in with incredible levels of resistance even and find something else, and make something else out of it. The trick is to let it burn you into ash until you stand over your remains and find that the important stuff stays. You catalysed a series of events that have irrevocably blown my heart open. And you continue to. I asked you one day “what do I about your dad?” And you told me to open my heart and I thought that was insanity but I did it anyway. I opened it further and I let him back in and do you know what I found there? Forgiveness. In the newly opened spaces I created for him, I found forgiveness. I didn’t need his acknowledgement that my lot has been so much worse than his. I didn’t need his apologies for things he should have been brave and strong enough to not do. He has looked at me with such sincerity and lied through his teeth with beautiful words and promises and solutions, so much so that I believe almost nothing that he tells me, including what he said that night. But even that doesn’t matter. Even that is unimportant on this journey, on this reshaping. What I learned that night is that forgiveness is not for the other person. Forgiveness is for the self. Is so the fire goes out and the important stuff doesn’t get burned up, too. Forgiveness has put an end to my anxiety and my anger. Forgiveness has given me hope, it’s given me back my future. Forgiveness has given me freedom. I don’t condone or accept how he behaved but I have been able to step away from it. To see more of him, the whole of him, his depths and his peaks. Forgiveness has allowed me to create boundaries around him. To have the good of him and not the worst. To remove his power over me, to remove my fear of him. Forgiveness will allow Vesta to have both of her parents, in the same room, without her having to manage our awkwardness or our anger. Forgiveness will show Vesta how to open her heart in such a way that every hurt she endures will dissolve into that vast space or will be incorporated into her being or, in the best cases, will roll off her back like so much water. I have so much more to forgive. Which brings me to my new year. To the entering into my third year without you. The forgiveness I have begun to feel around your dad will deepen and smooth, possibly over my entire lifetime but hopefully less. In this new year, I go about the business of forgiving myself. This year I will forgive myself for not being able to save you. For doing my best for my child not being enough. For disappearing into my grief. For allowing myself to remain in a relationship full of secrets and lies. For settling for “good enough”. For the malfunctions of my body. For the tearing open of my womb with no warning signs. For the shame and loss I feel of being infertile at 35. For letting the life I planned be utterly devastated and transformed. For not being the mother I planned to be. For all of the events and experiences I can no longer give Vesta because her family is split. I am not ashamed, Harvey. I stop before I say or do or write something because shame tells me that I will be judged or hurt or blamed or dismissed if I do. I stop now in the face of shame and I listen to my heart. I ask myself, “will I regret this? Can I endure the consequences of this?” And that is how I known if I am being true to myself, if I am going deeper or just swimming in shallow waters. I do and say and write things that feel shameful but are not because they are true to me. They are often, perhaps always, flawed and imperfect and messy but I do it anyway, if and only if the answers to those two question are “no” and “yes” respectively. I can endure a lot now. Nothing will be worse than losing you. No shame or judgement or blame. But being real and true and vulnerable? Because of you, I can no longer stop myself. I am so proud to be your Aunt. I keep following the course of your passage. I keep sending love and blessings, and keep a special room in my heart for you. This latest episode is so timely for what I am dealing with right now around John’s death and the stuff that death has kicked up. Forgiveness is a difficult path for me to find and stay on. However, the fruits are truly life giving. Thank you for the deep, deep reminders you keep putting out. My Mom, your grandmother truly understood what you are talking about in terms of Bravery not being the white knight galloping off and slaying the trolls. It is truly being terrified and frozen in place and unable to see the way ahead and taking one more tiny breath, one more tiny step. Blessing to you, dear one.